IT WAS a very strange hunt to say the least. The prey was in its element, a fearsome beast with multiple ways to defend itself physically – including spikes and poison - as well as in-built defensive traps that would slow down Indiana Jones in his prime. To make matters worse this foe can wreak environmental harm in fragile ecosystems and has no mercy in its desire for self-preservation. It is nature's equivalent to a trigger for nuclear war with annihilation of its surroundings a key threat. Sound a little over the top? Not really when you consider the enemy was a Crown of Thorns starfish. In a balanced eco-system the Crown of Thorns is surprisingly beneficial, dealing with fast growing corals that can block marine channels and take over from slower varieties. But in the waters off Fiji, where commercial fishermen have pillaged stocks of the predators that keep the starfish under control – such as hump-headed wrass, puffer fish and grouper - the population has exploded and it is now a major pest. And other creatures that keep the destructive critter at bay - the Triton’s trumpet and giant clams – have also been exploited because of their shells and have been unable to keep the crown of thorns at bay. This could be disastrous for the Yasawas economy as 90 per cent of the islands’ liquid income comes from tourism and the tourists who come to snorkel, dive and enjoy the beautiful reefs of the area. 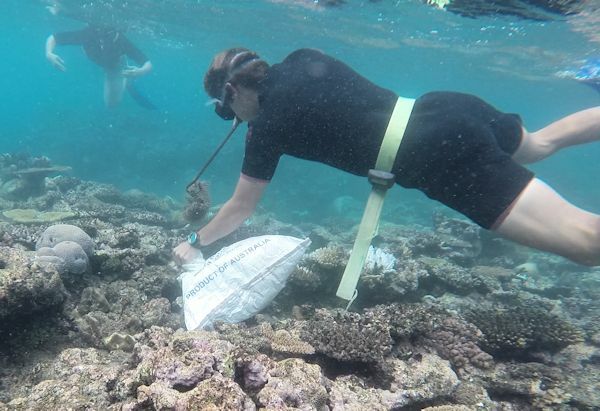 At the resort of Barefoot Manta on Drawaqa Island in the Yasawa Islands, it is a daily effort by the marine biology team led by Dan Bowling and Heather Pacey to try to reduce the menace. Teams of resort staff and volunteers from among the guests go on head out each day to under-threat reefs to physically remove the creatures. I join in on the hunt going to North Botera reef, about 5km from the resort, and using snorkeling gear act as a novice spotter for the divers. It is a worthwhile cause and a really enjoyable one. Swimming over the reef with mask and fins on you are told to look out for the tell-tale signs of crown of thorns predation and that is patches of bleached coral. That is coral destroyed by the starfish. The way in which the coral polyps are killed is not pleasant and is just one more reason to dislike this nasty little beast. The starfish’s stomach is extended out through its mouth to cover an area of coral about the size of itself. Then it secretes enzymes that liquify polyps so it can drink them like soup. One starfish can destroy up to 10 square metres of coral a year. No wonder it is such a menace in big numbers. Now finding the starfish as a beginner isn't an easy task, they hide in crevices amid their victims-to-be, and it is only after you have seen a couple that you start to recognize them more easily. They are mean looking and you can just tell from vicious venomous spikes that protrude from them that they are the bad guys of the reef. 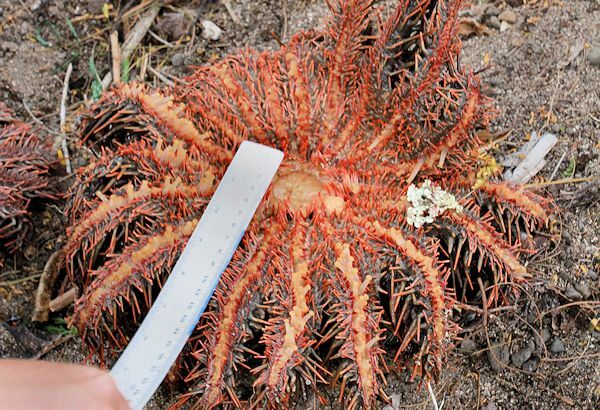 Even armed with an angled steel rod you need to be careful removing the starfish as if a female’s skin is punctured it will release 50 million eggs to saturate the area with new versions of itself. If it is killed a similar explosion occurs. And do not split them in half as that doubles the problem as the beast becomes two independent monsters. So the hunters carefully pull them out of the coral and place them in bags to be taken to the surface to meet their end. Even there care is needed as the spikes can prick skin through the carry sacks leaving painful, infected punctures that hurt for days. And the remains need to be disposed of carefully – on land so they won't reproduce - and away from plants as their extreme salt levels are toxic. The resort staff bury them in shallow sandy graves in an area set aside for their cemetery. Before they are unceremoniously dumped into the hole the starfish are measured for population studies and then the tossing begins. Marine biologist Dan Bowling says with a slight wry smile that some people say a few words over them as they are being covered. Richard Moore was in Fiji courtesy of Barefoot Manta Resort, Awesome Adventures Fiji and Vinaka Fiji.